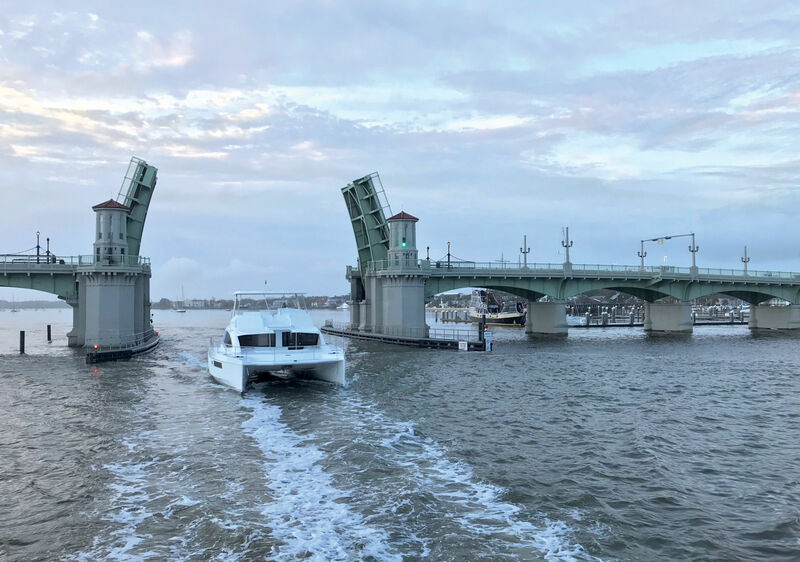 Over the course of two summers, Graham and his family cruised on their Fountaine Pajot catamaran along the eastern seaboard of North America. The section of coastline from Florida to the Chesapeake (effectively the lower half of the East Coast as you look at the map) can be traveled via the “inland” route of the Intracoastal Waterway. This turns out to be an interesting alternative to making the same passage in the open sea, and the catamaran’s shoal draft gave them access to some amazing anchorages. In the absolutely essential, must-have-on-board book, World Cruising Routes, in the chapter on Atlantic Routes from North America, our friend Jimmy Cornell says, “If adverse conditions persist… continue the voyage south inside the ICW, a solution taken every year by those who have either left the passage to the Caribbean too late or were not fortunate enough to meet the right conditions for this offshore passage.” Well, yes. 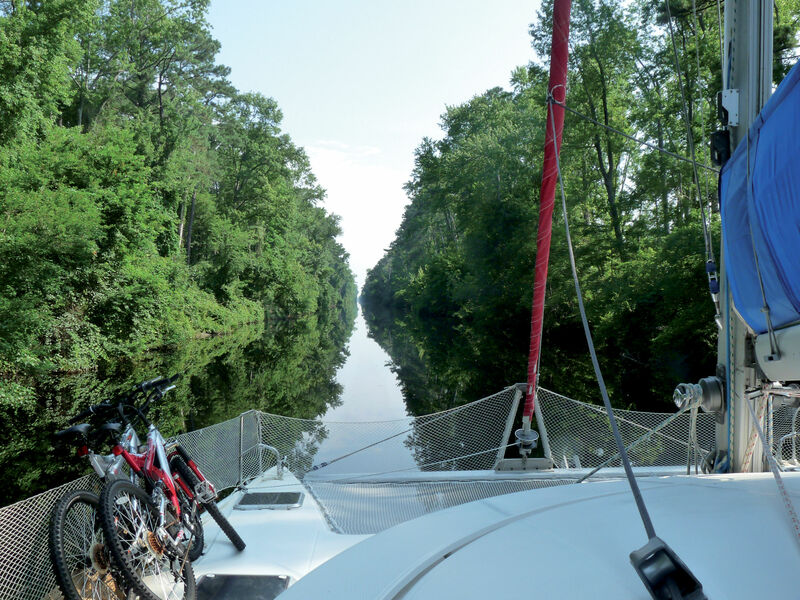 But, there are also many folks who actually want to sail along the ICW for its own sake. One particular week back last summer I spent a couple of days with a view from the steering wheel of a brand new catamaran (I do love working for this magazine), then the next day the view was from the steering wheel of an ancient tractor moving big bales of hay, and the rest of the week the view was of the keyboard and screen at my desk. The point is that it’s important to have variety. And this is just as true when cruising. We’ve crossed oceans, sailed into turquoise Polynesian lagoons, or picturesque, rock-strew Breton ports, and deserted Caribbean islands (ok, yes I made that last one up - I know there’s no such thing), but what about “inland” cruising? Our first experience was on the Brittany canals when we were in our twenties: a two-week vacation corresponded roundly with gale force winds. We decided to go explore inland, and ended up having a great time. Fast forward a few years and we’re on our way to the Caribbean on our cat. There wasn’t really much of plan - the theory being that without a plan, there’s little to go wrong. But with hurricane season approaching, a plan had to be made. Keep steering west and head for Panama, and through to the big ocean? Stay south and keep below the mythical 12°N? Well, we did none of that. We went north to see what America is all about. After some wonderful cruising in the Bahamas (amazing how many people said to us “the Bahamas is what I thought the Caribbean was going to be like”), we crossed from Grand Bahama and through Lake Worth Inlet. And there’s the important thing - through an inlet. But an inlet to what? The answer is the Atlantic Intracoastal Waterway, or ICW for short. To understand what this is all about, you first need to understand a little of the geography of America’s eastern seaboard, and a bit about its history. From a geographical viewpoint, most of the southern half of the east coast, really from New Jersey all the way to Florida, is low-lying and a lot of the coastal areas are made up of barrier islands. In fact many of the famous capes such as Cape Fear, Cape Hatteras, Cape Lookout, are all actually barrier islands. And much of the area between the barrier islands and the “mainland” is navigable. A lot of the so-called inlets are simply the gaps between the barrier islands, and these lead to rivers, on which are found many of the major east coast cities.